Last night the Rochester Knighthawks (12-5) defeated the New England Black Wolves (4-11) 14-6 in front of 8,535 fans at the Blue Cross Arena on Military Appreciation Night. A small part of the crowd came from Philadelphia in support of their former Wings players, and some others made the trip from Connecticut to support their Black Wolves. This game had a couple implications. The Knighthawks needed to win to still have a chance at the eastern division title, and the Black Wolves needed a win and a Buffalo loss to keep their slim playoff hopes alive. The game started quick with Cody Jamieson scoring just :20 into the contest, then Brad Self scores at the 5 minute mark for an early 2-0 lead. For the next seven minutes both goaltenders played fantastic. Angus Goodleaf limited the number of second chances by the New England offense, while Evan Kirk played as strong as ever keeping New England in the game. 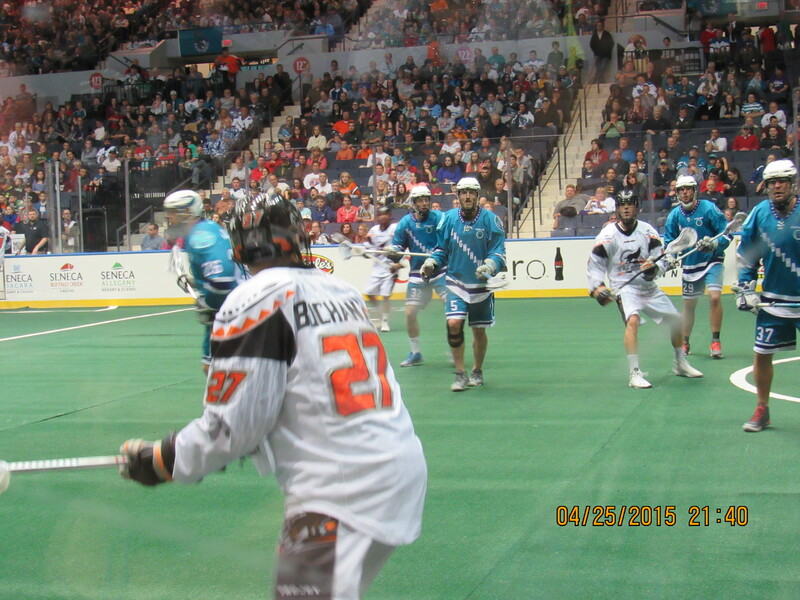 As the second quarter started the Knighthawks scored four of the next five goals to take a 6-2 lead at the half. But that wasn’t the story of the quarter. The story came at the 10:03 mark when Paul Dawson and Bill O’Brien squared off, two punches later O’Brien fell to the ground, Dawson walked to the box with a smile, and the fans of the Knighthawks gave a standing ovation. The third quarter was much like the first, hard battling and both teams’ scoring three goals apiece. But again it was the Knighthawk goaltending and the defense grabbing every loose ball possible (82-58) to keep a four goal lead. At the same time the Bandits were defeating Vancouver 9-6. When the fourth quarter was underway, Rochester scored the next three goals to build a 12-5 lead and seal the game with 9:16 left. Rochester would score two more times after New England scored their lone goal of the quarter and the game would end 14-6, a victory for Rochester. With the loss, New England has been eliminated from playoff contention. Even if they won they would have been eliminated as Buffalo defeated Vancouver 17-9. Cody Janieson led the Knighthawks and all scorers with 3G/7A and Joe Resetarits tallied 3G/3A. For New England, Pat Saunders and Kevin Buchanan scored twice. New England faces Buffalo Sunday at 6pm. Big game is next week. Friday night Toronto will travel to New England. A win by Toronto will lock up not only the #1 seed in east, but #1 overall. A loss by Toronto, and Rochester can claim #1 in the east with a win and #1 overall with an Edmonton loss.